Today's blog post was inspired by a very informative presentation I watched about citing sources. Citing sources in a genealogy program has been the bane of my entire genealogy process. Even five or so years into my family history research, I still find all of those little blanks, and the way the citation is organized once the data is in place, confusing to say the least. Anne Gillespie Mitchell gives a very liberating video presentation on how to plan your source citations, and talks about why it is important to cite your sources. She uses Family Tree Maker for the demonstration, but the information is transferable to any genealogy program. I've been playing around with Personal Ancestral File from FamilySearch, and ran into the same frustrations as before when I tried Gramps and MyHeritage. Who is the "author" of a death certificate? The clerk or registrar who filed it? The county it was filed in? The state? Anne outlines a very logical way to create a source citation that includes all of the information you need in order to find the source again, without the frustration of trying to figure out what information belongs in what box. The best part about the presentation is that Anne points out that there is no one way to cite your sources. You just have to think about what information you will need to know in order to find the resource again, or what you need to know in order to some day find the original source, such as a book or microfilm roll. Thanks, Anne, for taking the pressure off. It all seems so much simpler now. Census records are a marvelous way to discover where your ancestors lived, what they did for a living, and who else lived in the house. But what if you find errors in the census data that call into question whether or not this is the family member you are looking for? Who the Heck is Elizabeth? This has been one of the most confusing census conflicts I have come across. I know George Nowell and Rebecca Joplin married on July 4th or 5th of 1894 in Hillsboro, Hill County, Texas. (The family bible says 4, the Texas Marriages index says 5). So in 1900, they would have been married 6 years, as is indicated on the census. According to the family bible, George was born 9 April 1875, and Rebecca Joplin was born 19 March 1879 (her death certificate says 18 March 1879). So the birth months and years are also a match. The first child born to George and Rebecca Nowell was Della on 2 June 1895 according to the bible and her death certificate. Now here is the second inconsistency we come across. The census has "Ardella" born one month before George and Rebecca were married. However, looking to the date the census was taken (29 June 1900), my Della would have just turned 5, so the age still matches. But that brings up another problem - if George and Rebecca were married in July, they wouldn't have celebrated their 6th anniversary yet. So, back to the family bible, John Nowell was born 6 Nov 1897. Okay, that one fits. Additionally, all of the birth locations for self and parents match what I know. How do I reconcile the number of hits versus the number of misses? And the wife's first name seems like a huge miss! It wasn't until 1940 that census takers began recording who the informant for a household was. Browsing through 1940 census records, I noticed several instances of neighbors or landlords being the informant for a family unit. Like death certificates, the information found on a census is only as reliable as the person who supplied it. But prior to 1940, there is no way to know who provided the information on US censuses. But could a neighbor be so close on months and years of birth, but be completely wrong about the wife's first name? Is it possible that the census taker got the names from another source because no one was home, then went back for the rest of the information without double-checking the names? If I had been able to find George Nowell, born in Texas between 1874 and 1876 married to an Elizabeth on the 1910, 1920 or 1930 census, I would have simply dropped it there. But I couldn't find them. This isn't proof, but it does encourage one to keep looking for other information. Also living in Comanche County in 1900 were my George Nowell's brother, John R Nowell and family, in the same enumeration district. In fact, in order of visitation, John Nowell was 191, and George Nowell was 195. George and John's parents, Joseph B and Mattie Nowell, are also living in Comanche County, in a neighboring district, with their sister, Bettie Francis. This isn't firm proof, but it is highly suggestive. Oh, and did I mention, there are the only 3 Nowell households in Comanche County on the 1900 census (that I can find, anyway). In 1910, I find George and Rebecca, in Comanche County, with children Della, John, George, Zula and Maggie. This time all of the names and ages match up. George's parents are still in Comanche County, as is his brother John's family. They are still the only Nowell's I can find in the county. Again, this doesn't prove that "Elizabeth" was really Rebecca, but I can't discount the possibility that someone simply gave the census taker the wrong name, with some of the dates slightly skewed. Other ways to confirm the location of your ancestors when census records are somewhat sketchy include tax rolls, land records, and death certificates of children who may have died young. Have you encountered census data that matched everything but one or two glaring details? Were you able to reconcile the information you found, or are you still trying? Please share your own experiences with conflicting census data, either on your own blog, or in the comments below. This blog post was inspired by the fact that I was unable to comment on To Clean or Not to Clean... because I don't have one of the required profiles. So I'm commenting here instead. Tending the tombstones of family was very important to my great-grandmother, and I have gone out and washed the tombstones of my grandparents and great grandparents to get the bird poop off (water and nylon brush). While I can understand that some people would rather keep the antiquated look of an old cemetery, I for one would be very appreciative if someone decided to tidy up and make the tombstones of my ancestors easier to find and read. But since I'm already here, I'll elaborate a bit. My mom took her grandmother to the cemetery on a fairly regular basis to replace the flowers and straighten things up around our relatives graves. It was very important to her, and was perhaps a way of showing her respect and love. So a couple of years ago, my cousins and I had the idea to go out to the cemetery and replace the flowers. I hadn't been out there in years, and had no idea what condition the tombstones would be in. So I brought a couple of jugs of water and a nylon brush with me to make sure I could get some nice photos for Find a Grave. Obviously, these tombstones aren't very old, so all we were cleaning off was bird poop, lawn clippings and dirt. We had a great time giving Grandma, Granddaddy, Nanny, Papaw and Aunt Winnie their "baths", and I will bring along my brush and some water when we go back out there next month. I honestly didn't realize that there was such a debate over whether or not to clean tombstones until today. I do understand that old tombstones have to be cleaned carefully and properly, to avoid damaging them, and I wouldn't suggest using anything but water unless you have consulted with an expert. I've never gone around straightening up and cleaning the tombstones of others, but I truly appreciate those who care enough to do it, and do it right. 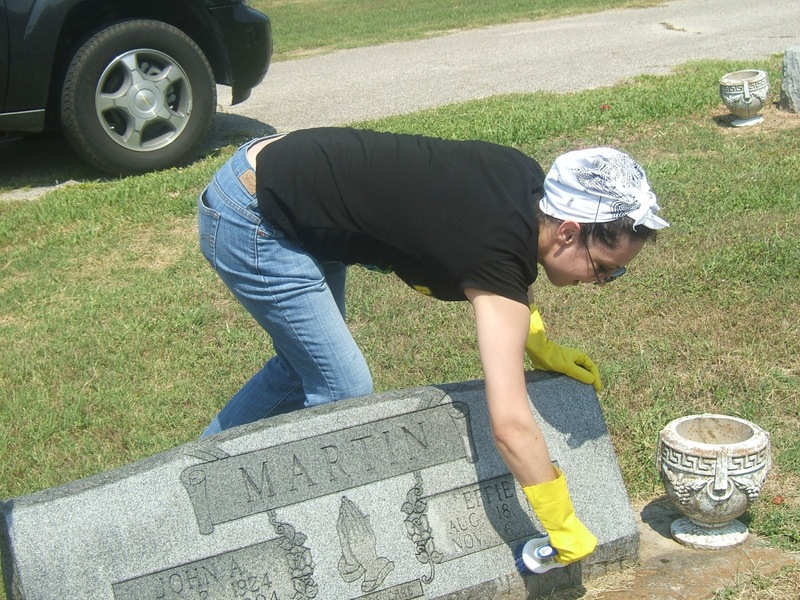 So if you haven't already, check out To Clean or Not to Clean.... Alisha provides some great tips on how restore old tombstones without causing further damage, and shows the dramatic difference that it makes. In celebration of Friday the 13th, I thought it would be fitting to follow some of the most "thrilling" Thriller Thursday posts I have come across at GeneaBloggers. While I know we are generally shocked/appalled/saddened to find such stories in our family histories, it is also fascinating to uncover such notorious events in our past. Thus, here follows some of the most intriguing, gruesome and tragic family history death, murder or near-miss stories I have come across on Geneabloggers' Thriller Thursday daily writing prompts. Thriller Thursday – Personal Ads May Be Hazardous to Your Health from my own tragic family history. Feel free to share stories or links to similar unfortunate incidents in your own family history in the comments below. The wonderful volunteers at FamilySearch are in the process of indexing the Texas death certificates from between 1977 and 1986. Some of the images are already searchable, but if you can't find what you are looking for, you can also browse the images. What? Browse over 1 million images?! Of course not, that would take ages. Fortunately, they have been divided into groups and subgroups. First, the death certificates are divided by year. Next they are sub-divided into month and county, or range of counties alphabetically. From there, they may or may not be in any particular order. So, to browse for my great grandmother's death certificate, I will choose 1980, then find the March certificates for McLennan County. March for McLennan County is divided between Volume 40 (Kendall - McLennan) and Volume 41 (McLennan - Nueces), so from there I have to decide if I want to start with Volume 40 and search for where the McLennan County certificates begin, or run through the images of this county in Volume 41 first, since McLennan will be the first county in that group. I'm going to go with the latter first, and if I don't find it there, I'll go back to Volume 40. Happy hunting! When you begin compiling your family tree, it is very easy to start chasing branch information in every direction. While it can be fun to find out about ancestors you never knew existed, it can also send you chasing down the wrong line if you don't collect enough data to be sure. If you can maintain focus on researching one family member at a time, you will have more sources to help you confirm (or disprove) those ancestors you have very little information about. Create a plan for collecting information about an ancestor. Have a look at your paper and pencil pedigree, and see what is missing. One possible strategy would be to start with your father, and follow along the numerical reference numbers of each family tree member, collecting (and recording!) as much data as you can find for each ancestor before moving on to the next. Or you could work along one particular line, perhaps researching each ancestor along your paternal line, or maternal line first. Just make sure you spend time working on each member of your family tree so that nothing gets overlooked. If you have developed a strategy, you already know which ancestor you want to start with. Now you need to search all of your available online resources (we'll get to genealogy libraries and other repositories when we have enough data to know what we are looking for). I like to start with FamilySearch because it is free and has an extensive collection of Texas family history resources. Enter the data you know about your relative, and see what comes up. If you don't find anything, go for something more specific, such as a marriage record. If you know the state where your ancestor was likely married, enter that in the marriage location. Remove the first names if you are still not getting any results. Be sure to add the spouse's last name, if you know it. If you know the names of the ancestor's parents, search for birth records or indexes by searching the parents names and location. If that doesn't work, try just searching the parent's last names. If the state's death certificates have been indexed, you can also find data by searching just for the parents' names or last names. This is a great way to find the children of an ancestor who's children would have died within a specific state during the period in which death certificates are currently available to the public. For census records, search the name and residence location during a given census year. If you don't know where the ancestor lived, leave the location blank and look for clues (spouse, children) that will help you find the correct family unit. Be sure to check Find A Grave to see if photos or information about an ancestor's grave site are available. Save all scanned images you find, and copy textual data into a notepad or word pad text file along with the source information. Be sure to give all files a name that will make the data easy to find again. Also write down your new findings on your pedigree and family group records. Some relatives are just very difficult to find much information on. If you've spent the whole day searching online databases, to no avail, it's okay. Move on to another ancestor. You can come back to that one later, perhaps when you are prepared to visit a genealogy library or local history archive. Please feel free to share your own tips and strategies for online research of ancestors. Family group records or sheets are a great way to keep information about families organized and updated as you learn more. They hold information about the husband, wife and children within a family unit. First, print out some blank family group records. I use the one from Ancestry.com because it includes a cause of death field, but there are many free family group record templates available online. Byub.org and NewEnglandAncestors.org both provide free family group records, or you can search Google or even make your own custom form with a spreadsheet program if you can't find one you like. Second, you are going to need your sources. Physical sources should always be kept together in an easily accessible location. The sources you find online should be downloaded if they are scanned images or PDFs, or recorded in a notebook or text file if not a downloadable resource. Go ahead and fill out a family group sheet with your parents as the husband and wife, and you and your siblings as the children. Only enter the information you have sources for, such as your birth certificate (which you should have by now, if not, order one from your local county court house), family bibles, marriage records or what you are absolutely certain of. For example, I don't think it is imperative to get copies of your siblings' birth and marriage records if you have had enough experience with celebrating their birthdays and anniversaries to know the dates. However, it sure won't hurt if you can get them. Even an email from your siblings giving the dates and places of major events in their lives will suffice as documentation, just be sure to print it out or save it to your computer. You will, if not right now, eventually, want a record of your parents' marriage. If you don't already have it, add it to your "to do" list. Same with death certificates, if either of your parents or any siblings are deceased. Continue in this same manner with your grandparents' family units and so on. You can do this on the back of the family group record. Simply write down the documents or other sources where you obtained the information (your birth certificate, a family bible, a transcribed interview with a relative, etc. ), and where the source is located (in your possession, on your computer, the county clerk, the genealogy library, etc.). Also indicate what information was provided by each source, as some documents will provide data on more than one event. For example, a death certificate usually contains birth date, birth location, death date and location, parent names, cause of death, and burial information. Every time you discover new information about an individual in your pedigree, update your family group sheet. This is why I always recommend filling these out in pencil. You may, as I have, discover that the birth date you found on a death certificate is in conflict with a birth record you recently found. The birth record would take precedence over the death record for the birth date because it was recorded closer to the time that the event happened. The best part about having a family group record for each ancestor in your line is that you will have quick access to the names of their children. This will aid you in searching for extended family, which can give you great clues in finding out more about your lineage. For example, many times older relatives would go to live with one of their children if they were no longer healthy enough to take care of themselves. Knowing all of a grandparent's siblings' names and data may help you find where a great grandparent lived out the remaining years of their life, especially if that great grandparent had a tricky name that was often spelled differently from one census to the next (yes, I'm talking about you, Miss Bettie Camilee Markham ;)). Keep your family group sheets together, and bring them where ever you do research, whether it is on the computer, a genealogy library, a relative's house, or any place your think you might find sources. You will also be able to use your family group sheets when you begin entering your family tree information into a genealogy program, but we will get to this later. Question: How important is it to get official documentation on your own living siblings, and why? Please share your opinions and views in the comments section. In celebration of the 4th of July holiday, Ancestry.com is providing free access to their 13 Colonies Collection through July 8th. The 13 Colonies Collection includes over 65 million records, predominately from the states along the east coast. The records are not limited to the colonial days, simply focused primarily on the areas relating to the 13 colonies. A free member account is required to view any of the documents offered during the Independence Day promotion at Ancestry.com. This will allow you to also save document images to your computer. What have I found so far? Just what my husband's ancestor, Jason R. Parker (abt. 1821 - 19 Jan 1890) was up to on 18 July 1867 in Towns County, Georgia. Feel free to share any awesome finds in the comments below! I will, too. For those that haven't stumbled upon this tremendous resource, Find A Grave contains (at present) 82 million grave records, many of which are accompanied by tombstone photos. 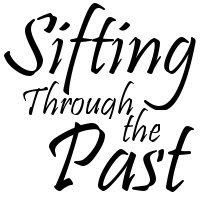 This is an excellent site for beginner genealogist to find important data and leads, as well as wonderful photos for your family history archive. Find A Grave can be searched by name, birth date, death date and cemetery location. You can also look up a specific cemetery and search it all of the surnames you have associated with that location; a great way to discover information about aunts, uncles, cousins and extended family. Some entries contain very little information at Find A Grave, but there are some that contain a great deal of historical data, such as my ancestor Isaac Low's Find A Grave page. The images and data are submitted by volunteers, and if you know the cemetery where your ancestor is buried, you can submit a photo request. If you live near a cemetery, you can find requests for photos and pitch in to help others. FindAGrave.com is a free service, supported by ads and sponsored pages (to remove ads). To place or fulfill photo requests, a free member account is required. If you have found something awesome and unexpected at Find A Grave, feel free share your find in the comments below. We love to hear about genealogy success stories. If you are looking for ready-made forms or templates to help organize or enrich your family history research, check out Genedocs Innovative Forms Library for a massive collection of free forms to accommodate just about every need. The 30 available forms at Genedocs cover a variety of genealogical subjects, including an ancestor outline list, research logs, military service summary, biography templates, timelines, and comparison tools for tracking family traits and naming patterns. You will also find planning forms to help prepare for inevitable life changing events. Note: If you don't have Microsoft Office, I've had no trouble importing the forms I've downloaded so far into OpenOffice. Also be sure to check out the Genedocs Blog. I, for one, will be spending this weekend transcribing census data into Census Summary Sheets. When you've scored your first scanned image of a family history record, you are definitely going to want a copy of it. But, since you are likely to find a number of other documents in your endeavors, you need a way to keep them organized so you can find them later. I found out the hard way that stuffing them all into one folder with their original file name quickly leads to time-consuming confusion and chaos. Over years of trial and error, I came up with a filing system that works very well for me now. You may want to develop your own system or adapt mine to your own needs. First, I made a Genealogy folder inside the My Documents folder. Within that folder, I created one folder for my dad's line and one for my mom's line (with their surnames as each folder name). Then within each of those folders I added folders for surnames married into that line, so I have three folders of surnames married into my Norman line. Then within those sub-folders, I continue to add surname folders as needed when I discover a new surname married into that line. Of course, these don't all have to be created at once, but can be done as you go. Now it's time to save the document. This is my file naming strategy to help my find exactly what I'm looking for easily. First I start with what type of record it is, birth, death, marriage, census, obituary, photo, etc. Then other relevant information that will help me identify it, such as date, name of the person/people the record relates to, etc. So, for example, I would save a census image as "census_1940_McLennan-Co-TX_Norman-George-Sr.jpg". This way, all of the census records I've found for Norman surnames are listed together, in order of year, then location, and finally head of household. If I find more than one household on the image, I'll separate the names with another underscore. Of course, this isn't the only way to manage the genealogy records you find online. I would love to hear about folder system and file naming strategies employed by others, as I am always working to better organize and structure my finds. Please leave a comment to share your own system. So you have your paper and pencil pedigree, and whatever documents you have managed to collect. Now it's time to look for what you don't have. Grab your pedigree and have a seat, we are going to look at how to find some basic information online. Family history record sites generally provide the same basic search fields, with some slight variations or additional search and filtering properties. Start by choosing one ancestor from your pedigree that you have some personal information for, such as their birth year or a location. Unless your ancestor has an extremely unusual name, you will need a little more information to narrow your results. If you don't know the birth year, go ahead and estimate it. Most sites offer you the ability to search within a range of specific dates, or indicate an offset of anywhere from 1 to 20 years. This will narrow your results to individuals with the same name born within the indicated time period. Know the state, but not the county? If you have an idea of what part of the state the person was born or lived in during their life, you can open a county map for that state in a separate browser tab so that you can compare it to the counties in your search results. For example, if you know they lived in East Texas, open up a Texas Counties map, and look for counties in the eastern part of the state. You can find state county maps at the usgenweb.org site for the given state, or just search google for [Name of State] county map (or Parish map if the state is Louisiana). Unless you are looking for a specific record, keep your searches fairly general. If you enter too much data, such as spouse and parents, you may end up filtering out records that don't contain this information. Experiment with different search combinations, such as the birth year, location, and father's name to get results for different types of documents. Or search just the last name with a residence location and date range to return all records of that surname living within the given area at a particular point in time. You can also just search the parents' names to find documents relating to their children. Many people go by nicknames, their middle name or even just their initials. This was no different in the past. One of my ancestors bears a different first name or initials on just about every census he appeared on. Be sure to search common nicknames ("Bill" or "Will for William", "Mattie" instead of Martha, "B. F." for Benjamin Franklin). Also, when searching for female ancestors, run separate searches for maiden name and married name. If you don't know the maiden name, it can usually be found on birth and death records for the ancestor's children, her own death record, and on marriage records. Some results will be accompanied by a scanned image of the record, but not all of them. In this case you will need to record the available data either in a .txt file (or whatever word processing file type you are familiar with), or in a notebook. This information will provide clues for further research, as well as information to help you find the physical record at a genealogy library or other history archive. This is hardly a comprehensive list, but it is enough to get you started. FamilySearch.org - A massive collection of digitized family history documents. Completely free to use. Ancestry.com - Possibly the largest collection of genealogical documents. Some collections are free to view, others require a subscription. HeritageQuestOnline.com - Can be accessed online if your library is subscribed. Go to your library's website and search their electronic resources for HeritageQuest to see if it is available to you. Have your library card ready. WorldVitalRecords.com - Requires a subscription. Feel free to add your own tips for finding family history documents online in the comments!